The Social Innovation Reasearch Prize (or SIforAGE Prize) 2014 winners have been announced. 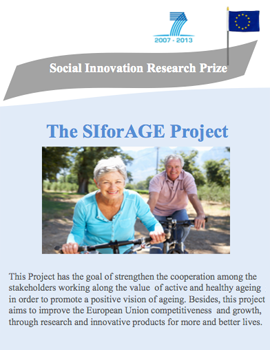 This prize aims to give recognition to projects that undertake research into social innovation in active and healthy ageing and that make significant contributions to ager communities, their families, and caregivers in order to promote an inclusive society. The three research projects proposals which have won are the Crowdmapping Mirafiori Sud project, the Active aging and intergenerational solidarity: an example in the University context project and the Enred@te project. The “Crowdmapping Mirafiori Sud” project’s core is to map physical, visual and cultural barriers which prevent the most vulnerable inhabitants (most of all, older persons) from enjoying the use of public spaces, by activating a participatory process within Mirafiori Sud district in Turin. Data gathered from the citizens in a collaborative way (using mobile cell phones, vocal messages or SMS, not necessarily through a web connection) are reported on line in a crowdsourced interactive map. The result is an inclusive instrument of sharing information, capable of equally empowering inhabitants and the Public Administration. Today the project is on a further implementation step, being adopted by the local district administration on an experimental basis on a wider area and range of topics. The project is led by a team of the CRD-PVS Research Centre and the Department Architecture and Design at the Politecnico di Torino (Italy), in collaboration with Mirafiori Sud Administrative District, Comunità di Mirafiori Foundation and City of Turin. The “Active aging and intergenerational solidarity: an example in the university context” project has as essential objective to improve an approximation and interaction between, possibly, the two most distant generational groups and plenty of stereotypes: the young and older people, trying to aware them about the valuable relevance of their social participation. At the same time, as the project is carried out in an university context, a perspective of professional exchange is pretended and a promotion of the intergenerational solidarity allows meeting and reflection spaces with older people that can involve a great social contribution with their experience to professionals of social education to be able to work with them in the future. That is to say, the project pretends to impulse the Active Ageing from Social Education to offer the possibility to the older people to adopt an active and dynamic role in their community and to offer the university students of Social Educators a place to develop and implement their knowledge, aptitudes and abilities to work with older people. The project is led by Silvia Martinez de Miguel and presented by the University School of Education of the University of Murcia, the Institute of Social Action from Murcia (IMAS) and the Professional College of Social Educators of the Region of Murcia. The Enred@te initiative defines an open and accessible digital social network for older people to meet others, communicate and stay informed through different contents of interest. In this network seniors and volunteers of Spanish Red Cross interact to strengthen usual relationships in the context of care and support. The network is accessible through Tablet devices and PCs. Enred@te aims to improve the communication and socialization of the older people through the promotion of the use of digital services among those who live or feel alone with the intention of avoiding that feeling of loneliness. Other important functionality included in Enred@te is the involvement of volunteerism, developing dynamic mechanisms and strategies through face-to-face and virtual voluntary participation. After two years of pilot phase, currently Enred@te is a complete service set up by Spanish Red Cross, in more than five different regions connected between them. The project is devised by Red Cross, Vodafone Foundation, and TECSOS Foundation.